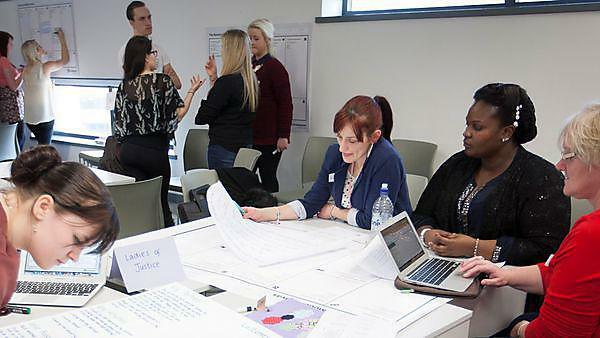 Teams of Criminology and Criminal Justice students took part in a highly competitive ‘Dragons’ Den’ type event in which experts from a range of criminal justice agencies judged their work. The teams were given a criminal justice problem that they might expect to face in a future CCJS career and were given two days to produce plans for a solution, before receiving initial feedback from some of the experts. They were then given time to polish up their pitches before presenting to the team of experts from Devon and Cornwall Police, Choices Consultancy Services, the Salvation Army, Plymouth Domestic Violence Service, Twelves Company and the University of Plymouth Student Union. The winning team was ‘Ladies of Justice’ who put forward a very convincing pitch to the panel and the experts were extremely impressed by the students’ efforts across the board. The event was such a success CCJS will be looking to repeat it next year! I have been given numerous opportunities throughout my time with the force… attending court, shadowing a Judge and observing Safer Neighbourhood and Response Team shifts. Being able to witness a range of roles within the force has been hugely beneficial. Sarah volunteered with Hampshire Constabulary during her degree and received a ‘highly commended’ award for her efforts. "Since starting my degree back in 2011 my ambition to join the police has been confirmed, especially since I have been working with the force and developed a passion for what I have been doing. Having a chance like this is priceless, as I have been able to network with a number of officers who have since been invaluable to me in helping with my police-based dissertation, as well as recently joining as a Special Constable with the force." For her work Sarah was nominated for the Police Support Volunteer Award 2013, and was presented with a 'Highly Commended' award for her 'continued support to Hampshire Constabulary and in particular to the collation of evidence and supporting the ASB officer in the application of crack house closure orders'. The Plymouth Law and Criminal Justice Review is an annual publication in which students are invited to showcase their work. This is an excellent opportunity for students in furthering their personal and professional development.